Boca Raton Pediatric Associates is proud to be the first pediatric group in Boca Raton, and 30 years later, we continue in our dedication to provide high quality pediatric care in our community and the areas surrounding Boca Raton. We offer two service locations in Boca Raton, our main East Office with easy access to I-95, and our West Office with easy access to Florida’s Turnpike. We know we are doing something unique when many of our patients travel from more distant locations within Palm Beach and Broward Counties to take advantage of the care we provide. We are a small group practice. This gives us the opportunity to offer office hours 7 days a week and 24 hour coverage. Unlike larger group practices, we are able to provide a more intimate, warm and friendly setting. Our group consists of three physicians, Dr. Jerry Wexler, Dr. Jack Blanco and Dr. Suzanne Laskas. Our very capable staff adds to the stability of our practice, many having been with us for over 20 years. They are an integral part of our desire to provide a comfortable setting where faces and names are recognized as you enter. We pride ourselves with short waiting times for appointments and any children needing care for illness are always given appointments on the day you call. Our families quickly find that ample time is provided at each appointment to address your concerns and that all questions can be answered. Above all, we want our parents and patients to feel at ease to discuss any problem or question that you might have. 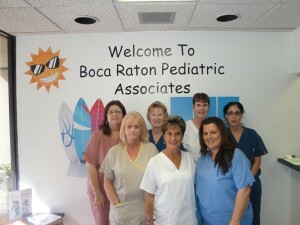 Welcome to the Boca Raton Pediatric Associates family! We look forward to working together with you. Our goal is to provide the highest quality of care for your children.